Hello! It's Handmade Monday time again! The countdown is on for me. I am planning to launch my new website on 3rd June 2013! I'm still frantically trying to get a good collection of printables together, but I'm getting there, and I'm steadily building the site day by day too. I have to remind myself that it will continue to grow after launching. It's just a beginning! I've had some really amazing help from people testing my stamps - and I'm so, so grateful to everyone who's helped me. It's been great to see similar opinions and suggestions coming up from more than one person, but pretty much everything the testers have said has been really useful. Meanwhile, I did a little testing myself - I figured it was only right that I should! It's been a good few years since I made cards, but I always enjoyed it. It was my dad's 85th birthday yesterday - I thought that would be as good a place to start as any. 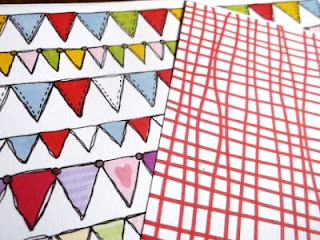 but I also used the red polka dot from this month's Craftseller magazine (have you seen the new look magazine yet? It's in the shops on Tuesday). I also threw into the mix some sky blue paper from an old copy of Simply Homemade magazine. 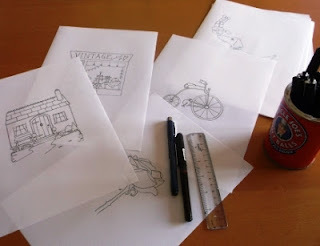 In fact, it was these Emma Ball papers that made me realise people just might buy hand-drawn/painted craft papers and digi stamps and that my Photoshop skills (or lack thereof, to be much more accurate) didn't have to hold me back! 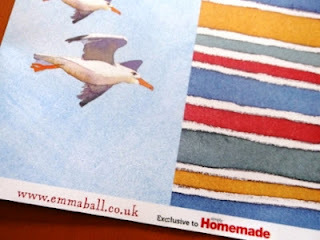 Pop over to Emma's website, if you have a minute - it's very inspiring and she does lots of seasidey stuff, which I love! I've admired her artwork for a long while, so it's actually really lovely that seeing her craft papers was a kind of catalyst for me. My dad loved his card and said it was his favourite. Sometimes, it's the little things that make a big difference, isn't it? A beautiful card. It's lovely being able to make something lovely for someone you love. 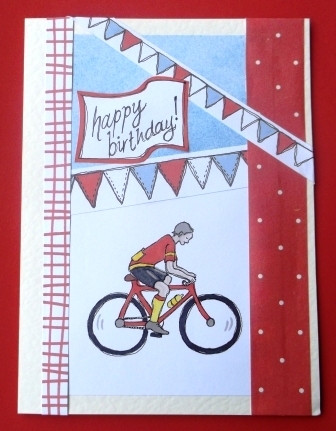 Very nice and appropriate card - he did well cycling till his 70s! It looks like 'one of yours' I think you have definitely created your style! Oh i'm so excited for your new venture Wendy, I just know the site will be gorgeous! Gosh Wendy, you've been so busy, good luck with your new website. I love the colours in your card for your dad, it's nice and crisp looking. Happy Birthday to your Dad. I like personalized cards. I always buy one for my manager who loves cats. It's great to have your own craft paper designed. I can't wait to see your website! I don't know how you do it, you have your finger in so many pies, you are such an inspiration! Your card looks lovely! I really like the look of your stamp designs and papers - they are so "you". You have a wonderful style. How exciting. 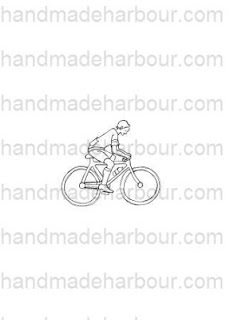 I am a bit confused about what a digistamp is, so can't wait to see your new website and find out. Love the bunting paper. Ginx craft - The name is a bit misleading really! A digi stamp is the digital take on a rubber stamp. People buy an image online, usually a black and white one, and print it off at home. Then they can use it like a rubber stamp, colour it and put it on a card. I don't know if that helps or confuses, but I'll try and explain it better on my website! The card looks great.No wonder your dad liked it so much. I love making cards as it is so personal, just a shame i don't get chance. Looking forward to the website launch! It is so nice to be able to make a personal card, especially for a dad as the commercial ones seemed to have such limited ideas! Good luck with the new website tho I am sure you will have loads of success. what a lovely, thoughtful card for your dad. 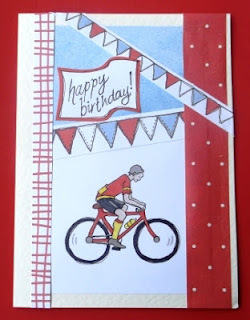 Really like the way you've used such a great mixture of craft papers. 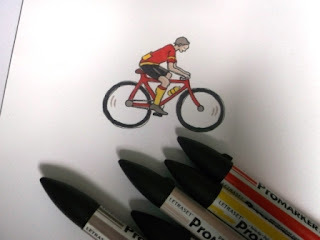 The digi-stamps are brilliant and I am enjoying using them - thank you, and I will post pics soon and email you my feedback. Hope you have a good week. Those digi stamps are looking pretty cool! Well done Wendy. I know exactly what you mean about remembering that your website is just the beginning - it's so tempting to keep delaying launch until you've got everything 'just so' but it's definitely an ongoing work in progress - really looking forward to seeing it!